Do you need a simple editor for writing and hosting the terms and conditions of your contests and giveaways? You can use the free Easypromos tool for terms and conditions. 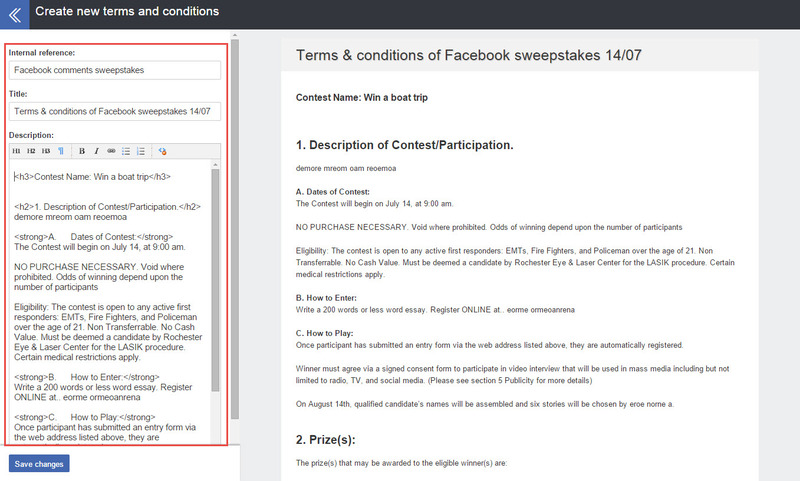 It’s especially useful for Twitter and Facebook giveaways (where space to explain legal details is in short supply). You can also apply it to promotions or contests on other channels, such as your own website. Where can you find the terms and conditions tool? Go to the Easypromos Dashboard and you'll find the tool in the "Utilities" drop-down menu. You’ll see a page where any terms and conditions you create will be listed. This means you can reuse them if you need to. 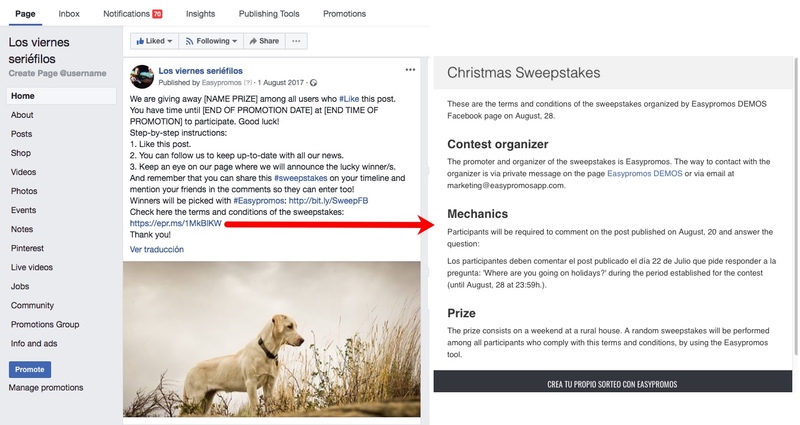 For example, you can write one set of terms and conditions for giveaways based on Facebook 'likes', another set for photo contests, and a third set for pick-a-winner contests using Twitter retweets. 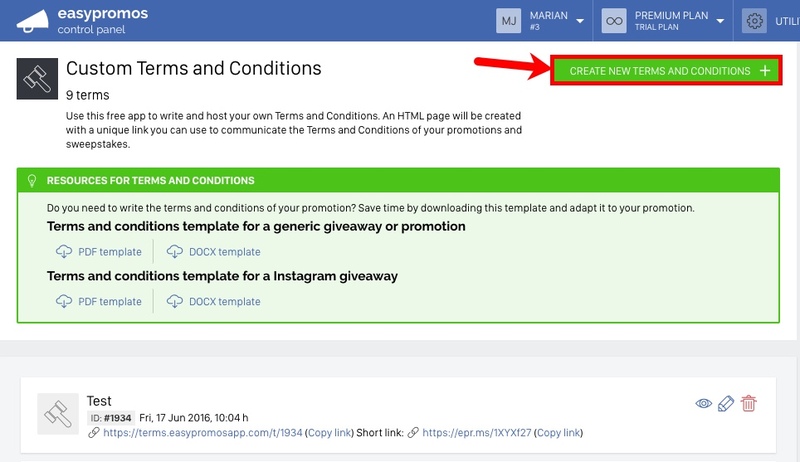 Use the "Create new Terms and Conditions" button to create a new page. Terms and conditions template for a generic giveaway or promotion. Terms and conditions template for an Instagram giveaway. When you click on the “Create New Terms and Conditions” button, you'll be taken to the editor. You'll use this to write the terms and conditions. Copy and paste the text from our templates, or write your own terms and conditions in the left-hand panel. You'll see them displayed in the preview section on the right as you go. Always save changes before leaving the page! If you go back to the list of terms and conditions, you'll see that your new Terms and Conditions have been added. The list includes useful features such as a link and shortcut link to each set of terms and conditions that you create. You’ll be able to copy these links and use them in Facebook and Twitter posts for contests and giveaways, as well as on any other site where you need a dedicated space to host the legal bases.